Hi, my name is Ina and I`m a Sports, Remedial & Clinical massage therapist. I gained all my qualifications in London and I have also trained in Anatomy and Physiology, Swedish, Deep Tissue, and Indian Head Massage. I am a professional member of The Federation of Holistic Therapists and I`m fully insured to practice massage. I tailor each treatment to the specific needs of the client, combining all my therapeutic skills to deliver the best massage. About me… I have a bubbly personality, I`m energetic and I love meeting new people. I have tried other careers, such as journalism and customer service, before I realized massage was my calling. I am willing to travel at short notice anywhere around Romania and I`m available for touring. 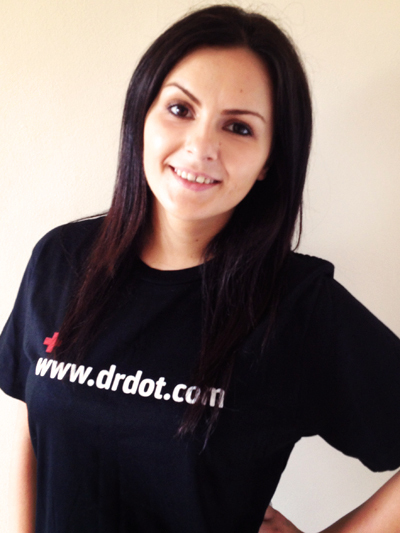 I`m very excited to be part of Dr. Dot`s team and I look forward to treating you!